Hanging baskets and summer flowerpots usually include geraniums, not only for their color but also for their fresh fragrance. There are many varieties of these delightful summer blooms, each with its own particular scent. In aromatherapy the most common geranium used as an essential oil is the Pelargonium Graveolens. This variety, when steam distilled has a light green color and a fresh, sometimes appley, scent, though depending on where it is grown, geranium essential oil can also have a lemony or rose-like smell. Only the tops and flower heads are used to make the essential oil and the best plants come from South Africa, the Bourbon region and Russia. Geranium blends well with other essential oils, heightening their efficacy. Geranium essential oil has an uplifting and stimulating fragrance and is very useful in states of depression and anxiety. Because of its relaxing effect on the nervous system, this oil can help reduce nervous tension and fearful skittishness. It also is wonderful for alleviating joint pain caused by hypertension and hyperacidity in the body. Its calming and balancing effect makes it a pleasant oil to burn in an aroma lamp during times of stress and mental overactivity. Geranium is also well known as a skin rejuvenator. Its ability to balance the oil glands in the body means it is great for both oily and dry skin and is marvelous in reducing wrinkles and signs of aging skin. Because of its astringent and cleansing properties it can be added to skin lotions and creams, and is also good in skin preparations for wounds, eczema and acne. 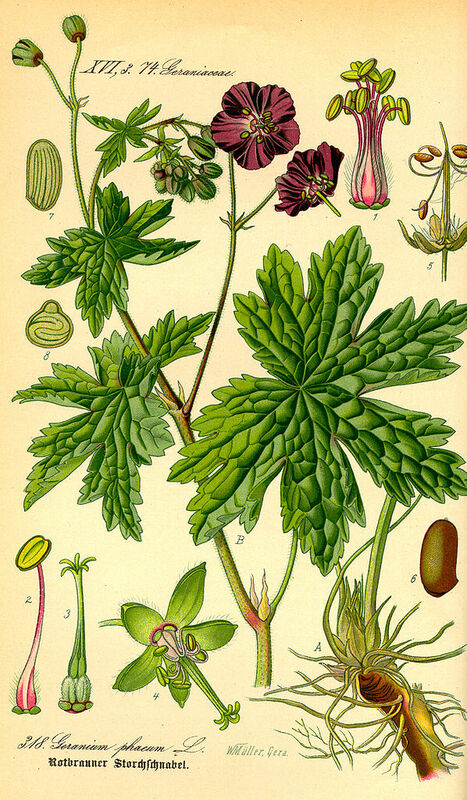 Geranium has been effective in healing scar tissue after surgery because it encourages cellular regeneration. It is also helpful in healing burns and ulcers. As an insect repellant it is very effective at keeping mosquitoes at bay, especially when mixed with citronella. When used in massage, geranium oil has been known to stimulate the endocrine system. Its calming and balancing effect on the adrenals makes it a wonderful aid as an anti-depressant. It also can work on the thyroid and reproductive hormones by balancing the hyposecretion of estrogens. This makes it a valuable aid in menopausal problems. Geranium also encourages better functioning of the kidneys and is good as a mild diuretic. Geranium essential oil has antiseptic properties and can be useful for throat and mouth infections as a gargle or mouth wash. As an inhalant when used in an aroma lamp, geranium can ease lung disorders and reduce lung inflammation. On a psycho-spiritual basis, geranium is balancing and grounding. It can stimulate a sensual feeling in the body and is therefore considered a mild aphrodisiac. It also has been used in meditation incenses because of its ease in blending with other higher frequency oils such as frankincense and sandalwood. It has a warming, slightly yin quality and thus makes it a lovely bath oil to soak in when balance and rejuvenation is needed. So this summer when planting your hanging baskets, enjoy your geraniums and know that you are being balanced in mind, body and spirit.